I find that I’m reflecting on a memorable Cisco Live while grinding on the post-prandial activities that go with returning to work. 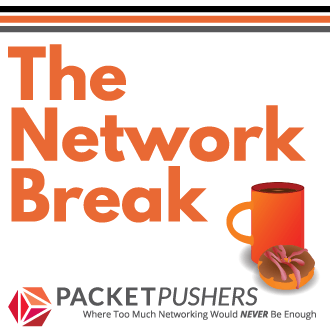 Networking is Changing, Alive and Exciting again. 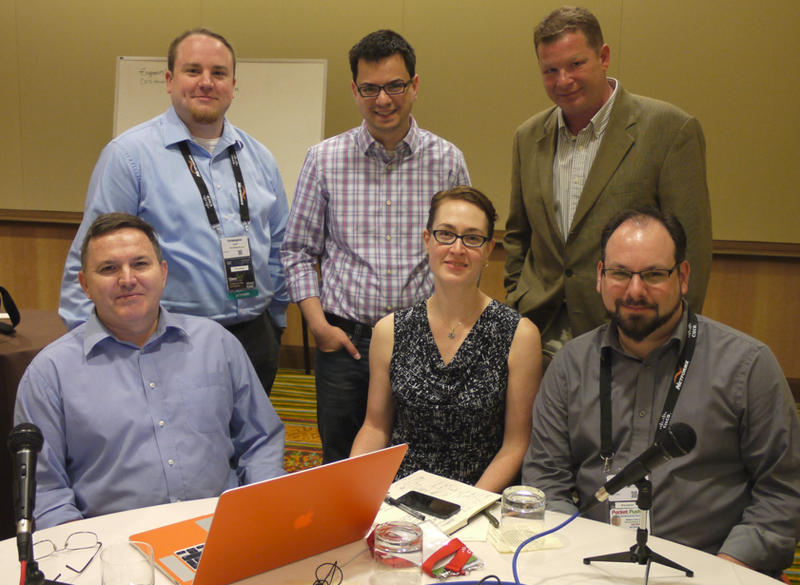 Since 2010 I’ve attended Cisco Live four or five times in different roles – press, social media & personally. 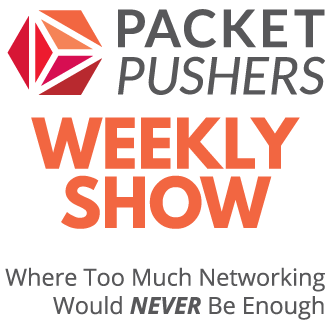 While it’s hard to single out what has improved, my overwhelming impression is that Networking is changing radically. Instead of sitting through endless sessions on protocol mechanics of BGP, or switch architectures on the Cat6500 (for the n’th time), the vagaries of MPLS-TE or tedious keynotes, I had discussions on genuinely new technologies, products and insights into what I believe are profound technology changes in IT infrastructure. I haven’t been this excited since the late 1990’s when I first discovered network management platforms with GUI consoles. Packet Pushers was sponsored by Cisco Data Centre team to cover the event. We have recorded a number of shows that will be published starting today on Cisco technology topics like IPv6, UCS Director (was Cloupia), Nexus 7700, OTV/Fabric Path/LISP and Cisco XNC controller. Cisco is clearly not leading the marketing and technology of Software Defined Networking. I regard Open Daylight Project as demonstration of attempting to control the direction of SDN. It’s clear that the marketing folks have decided to call it “Application Centric Infrastructure” in an attempt to build a naming convention that Cisco can control and direct. It remains true that SDN hasn’t been translated into business value but I still take the view that SDN is a technology-led solution to business problems and will be marketing resistant over time. Previous examples are QoS and MPLS. I was wrong about Insieme and there was no launch. There was some vague hand waving in the direction of integrated fabrics. Best guess is something later this year. I remain somewhat doubtful about the possible technology choices that Insieme will pursue. Given the other technologies announced (see DFA below) I suspect that it’s might be an x86 server technology that allows CPU/Memory/Storage clustering over a PCI backplane fabric (PCI can be a networking technology) – only time will tell. The two biggest technology announcements that interested me was Dynamic Fabric Automation (DFA) and UCS Director (nee Cloupia). I attended the NetVet session for the first time where John Chambers took questions from the audience. I actually got to speak to him personally and asked him to appear on Packet Pushers and am working to see if this can happen. I got a number of insights into Cisco’s business process. John Chambers made a point that some of the business units have not performed well & “changes have been made”. Also, admitting that perhaps the changes two years too late but that we will see a renewed Cisco in the future. There are some signs of change today but too early to tell if it is successful. 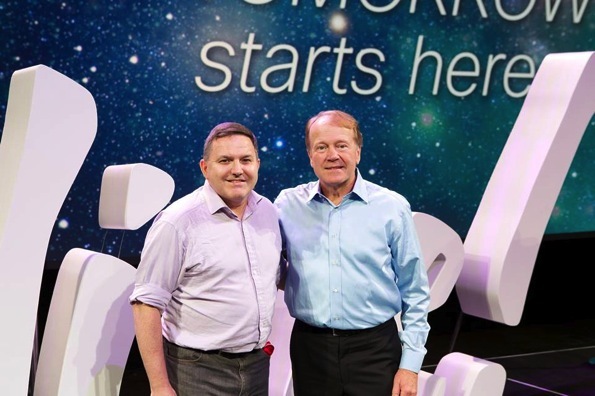 Greg and John Chambers – saying thanks for all the job opportunities and privileges that Cisco has brought me. It is easy to be cynical of social media but I enjoyed a lot of interesting conversations, met folks who I admire and had an excellent time at parties because I “knew” people before I met them and they were will to put up with my company (and drunken singing) . Instead of being alone at the parties, I had a group of people to joke, laugh and drink with. It was great and thanks to everyone who put up with me. You can’t expect every conference to be enjoyable & satisfying but I did this time. I didn’t mind the heat that Ethan didn’t enjoy. And the bus transport to the large events was shambolic. Minor scars overall. But it’s great to see that networking is changing and new technologies are arriving. Cisco may be late to the SDN party with the “Application Centric Infrastructure” (you are going to hear a LOT of that) but there is hope for the future. The Open Daylight Project continues to surprise me with solid progress (Brent Salisbury tells me every chance he gets). I had discussions on new licensing initiatives, got excited about “EIGRP over the Top”, got more excited about LISP (again) and the list goes on. My summary ? NETWORKING IS COOL AGAIN. And how I’ve missed that for the last five years. I love the comment on the picture with John, I think the same, thank you John. I’ve never been cynical of SoMe myself but I’m often criticised by others for participating. I think the other thing changing about networking is that we are seeing new talent again. Because it is exciting, the caliber of people coming to networking (or back in some cases) is higher than I remember in awhile. And that talent is being put center stage. I love what Dave Ward and his team are doing. And the fact that he is being given a pulpit of sorts is good for the industry. And I like that guys like Puppet and Ansible and Salt are all in the mix now. The walls around networking are a little less tall, and people from surrounding areas are involved. Makes it more interesting. I got the impression Inseime is going to move Cisco into the Hypervisor market. I was really looking forward to your comments on the 6800 as well.